The Imperial Crypt (German: Kaisergruft) in Vienna, Austria, also called the Capuchin Crypt (Kapuzinergruft), is a burial chamber beneath the Capuchin Church and monastery. 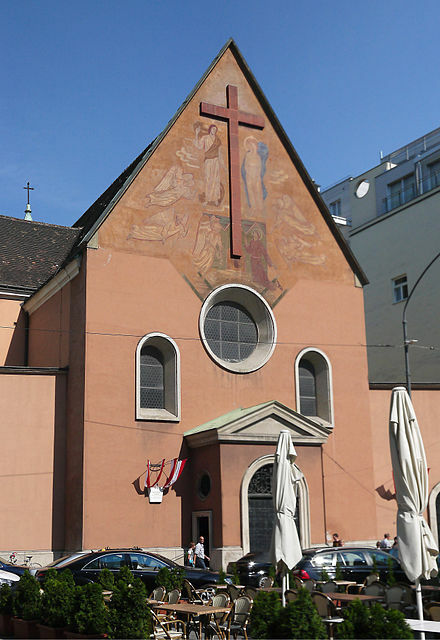 The church was founded in 1618 and dedicated in 1632. It is located on the Neuer Markt square of the Innere Stadt, near the Hofburg Palace. Since 1633, the Imperial Crypt has been the principal place of entombment for members of the House of Habsburg. The bones of 145 Habsburg royalty, plus urns containing the hearts or cremated remains of four others are here, including 12 emperors and 18 empresses. Some of the dozen resident Capuchin friars continue their customary role as the guardians and caretakers of the crypt, along with their other pastoral work in Vienna. The most recent entombment was in 2011 of Otto von Habsburg. Otto von Habsburg was the son of the Blessed Karl, Last Emperor of Austria, Apostolic King of Hungary. He had possessed great titles, wealth, and social status while on earth, but these counted as nothing before God. Only with a humble and contrite heart would he stand before the judgement of the Lord, trembling in fear and awe. Friar: We do not know him. MC: Dr. Otto von Habsburg, President and Honorary President of the Paneuropean Union, Member and quondam President of the European Parliament, honorary doctor of many universities, honorary citizen of many cities in Central Europe, member of numerous venerable academies and institutes, recipient of high civil and ecclesiastical honours, awards, and medals, which were given him in recognition of his decades-long struggle for the freedom of peoples for justice and right. MC: Otto, a mortal and sinful man. Friar: Then let him come in. This entry was posted in Sin and tagged Habsburger Ritual, Knocking Ceremony. Bookmark the permalink.